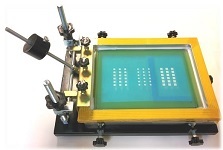 The manual table screen printer is designed to meet the requirements of DSSC research. It is easy to master and researchers can thus quickly start producing reproducible electrodes. The glass substrate can easily be mounted and efficeintly positioned using adjusting screws in x- and y-direction. With a screen size of 30 cm x 40 cm, we recommend to use the printer for substrate sizes up to 10 cm x 20 cm. In order to promote a fast and straightforward usage, the machine is delivered with a start-up kit, see below.